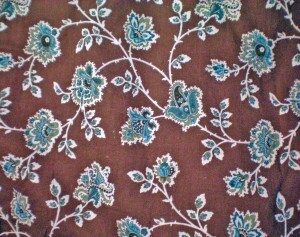 When I found this fabric, I knew it would be perfect for a dress from the late 1700s. 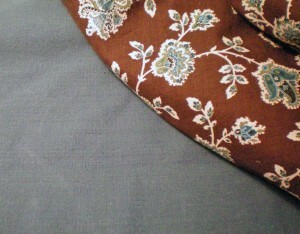 From what I’ve seen of antique textiles, the pattern is very authentic—and I love the colors. 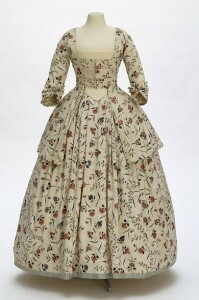 I have the Robe à l’Anglaise pattern from J.P. Ryan, but I’ve already made two dresses from it. For this gown, I think I’d like to try either the Caraco or Jacket pattern. 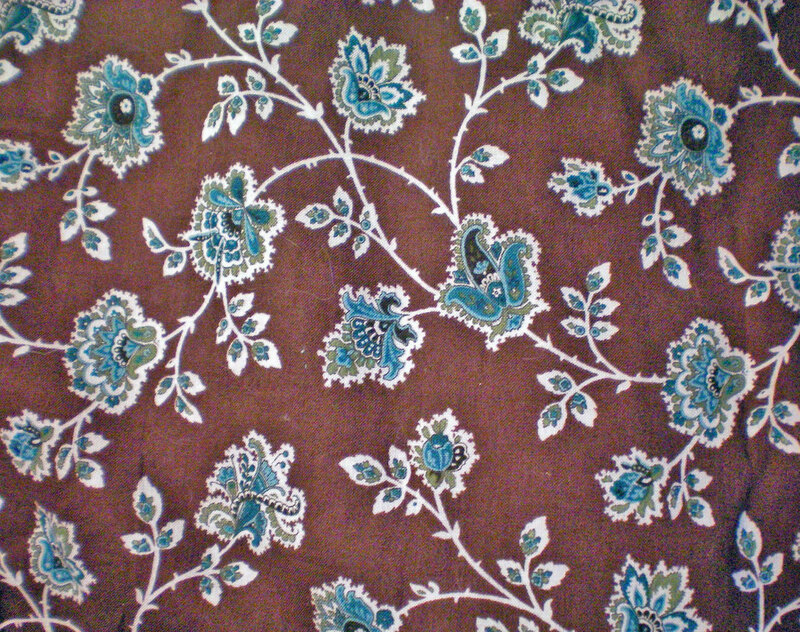 I bought extra yardage of the brown and teal fabric so that I could make a modern dress from it in addition to the caraco, but now I think that I will combine all of the fabric to make a jacket with matching petticoat. It isn’t common to see a matched set, but there are historic examples, like this one from the Victoria & Albert Museum. The ensemble from the V&A museum has some really pretty features. I love the unusual stomacher, which appears to fit under the cross-bands of the caraco bodice. I also like the shorter length of the caraco, which would be more flattering on me since I’m petite. 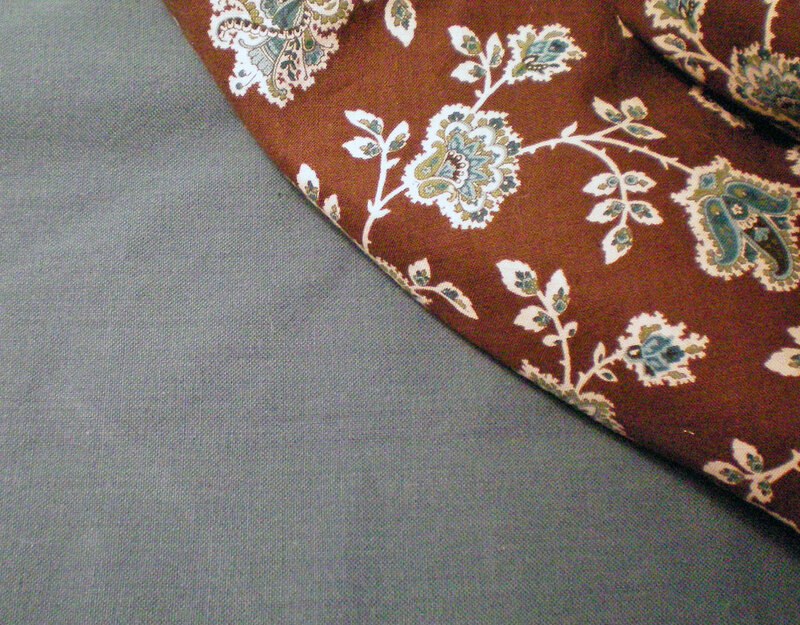 I could perhaps use the blue-green shot cotton to add a bias band to the hem, as in the example shown. Have you made a caraco lately? What inspiration did you use? Do you recommend the caraco or the jacket pattern? This entry was posted in Sunday's Someday Projects and tagged 18th Century, Sunday. Bookmark the permalink. Love the fabric! Great find! And if you ever do find a perfect matching blue or brown, you can make yourself a second petticoat No recommendation on the pattern – I always draft my own based on extent examples. I can’t wait to see what you use and how it comes out! Ooh, a second petticoat. What a great idea! I really do love the fabric.